This is our 40' Mega Sports Obstacle. This obstacle course is great for all ages. 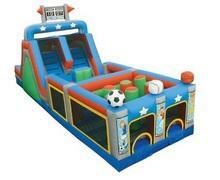 It features several pop up obstacles and 12' slide.